Edvald Boasson Hagen (Columbia-HTC) won the third stage of the 2009 Tour of Britain in Gretna Green on Monday thanks to a high-speed lead out from his team mates on the fast and dead-straight finish. The Norwegian star, who was recently announced to be riding for Team Sky in 2010, outgunned Italy’s Michele Merlo (Barloworld) and stage one winner Chris Sutton (Garmin-Slipstream) to take his first victory of this year’s race. Last year, he claimed three stages before emerging as one of the most exciting young talents in the sport. Russell Downing (CandiTV-Marshalls Pasta) was best Brit in the sprint, finishing sixth after being held-up in the fight for position. There was no success for any elopers on the 153.8km route from Peebles to Gretna Green today. Darren Lapthorne (Rapha-Condor) finally flew the flag for the British teams when he got in a four-man move but they were caught 25km from the finish. Lapthorne then had a double puncture and finished 12 minutes down. The Agritubel team took turns to attack but even a good late solo effort from Emilien Benoît-Bergès was also nullified by the peloton in the run-in to the finish. Columbia then hit the front just like they have done in so many races in the last two years. Mark Cavendish has often finished off the job but this time, with Cav recovering from a chest infection after pulling out of the Tour of Missouri, Boasson Hagen was the designated sprinter. He finished off the great work done by Columbia with ease. Thanks to a ten-second time bonus, he also jumped to second overall, 11 seconds behind Dutchman Kai Reus (Rabobank) and could emerge as a real overall threat. “Last year was really great and I hoped to win a stage this year. It was really good I made it happen today,” Boasson Hagen said in the winner’s press conference. Boasson Hagen’s win was the first by a rider who will ride for Team Sky in 2010. It will go down as Team Columbia’s 74th win of the season but is also a sign that Team Sky were right to go after the talented Norwegian. He can win sprints, be a major star in classics and could eventually develop into a Tour contender. “I’m really excited about joining Team Sky, I think it’s going to be a really good team,” Boasson Hagen said of his future in the British-based squad. On Tuesday the Tour of Britain heads into the hills for stage four. It is a 151km testing loop through the Forest of Bowland that starts and finishes in Blackpool. It includes the climbs of Tatham Fells, the Cross of Greet and Waddington Fell. However, all three climbs are in the middle of the stage before a long run-in to the Blackpool promenade. 10. Geraint Thomas (GB) Barloworld all same time. 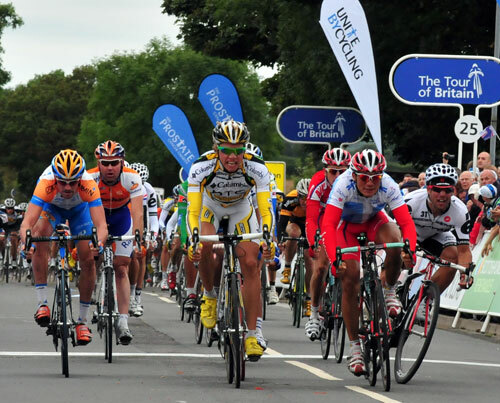 Can a British rider win the Tour of Britain?